Commemoration, Gnó Mhaigh Eo and we are delighted to be joined again by Craftworks Mayo | Ceardaíocht Mhaigh Eo to showcase the best of Mayo products - ‘Déanta i Maigh Eo'. On Friday 19th at 8pm, following up on last year's fun, there will be the Bonamh Market Piggy Grand Prix 2016!! 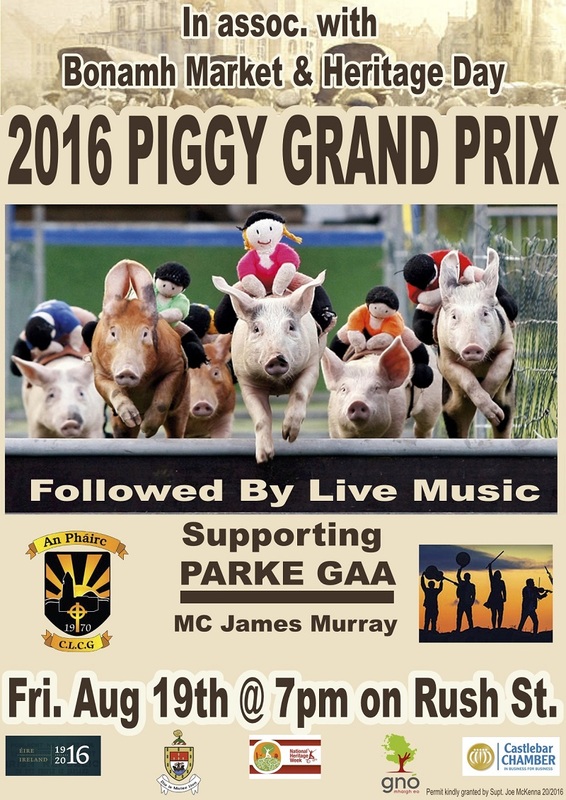 This is an evening of fun pig racing.....rásaíocht mhuc! It is run like a "race night", except specially trained pigs will be running, or more like trotting, instead of virtual horses. These races take place all over Ireland during the summer, but only in town for the second time. Pigs are available to buy at €30 each in any of the 6 pubs on the street. Groups of 4 and 5 can chip in to own one, and pick a name and even the jockey's name!! After all the excitement of this evening's race meeting, there will be music on the street until 11.30pm. For the last 2 years the traditional pig market that used to take place in this street every Saturday years ago was revived. In those times, men and women, and sometimes children, would come to Rush St and sell their pigs, calves, cabbage, etc. This market was very much a part of Castlebar and many great characters passed through there. 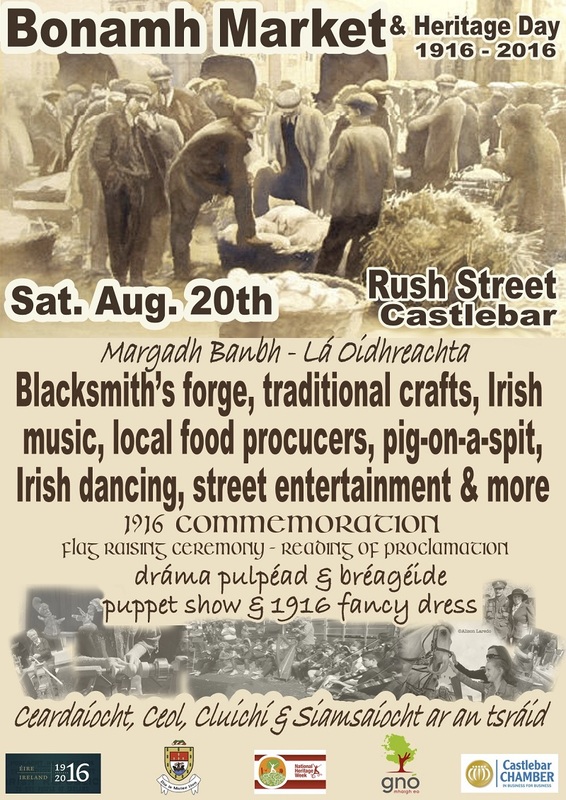 On August 20th, the traders of the street will relive this part of Castlebar's past. The characters will be back again with their wares: the street will be set up like a market. The forge will be there, along with a thatcher, baker, food stalls etc. There will be musicians playing on bales of hay, dancers dancing and plenty of fun to make this a great day out for everyone. Beidh ceol, damhsa agus craic, mar sin bígí linn!. There will the animals from the the local Pet Farm, bouncy castles, Elvery's football challenge and a display of old cars, old tractors and farm machinery. Gnó Mhaigh Eo will be there with a bi-lingual puppet show too. This was a great hit in Castlebar recently and is a must see for all the family. This year will recognise the 100th anniversary of the 1916 Rising. Re-enactors from Glencorrib will be joining us with their brilliant float that took first prize at this year's St. Patrick's Day parade. The street will be decked out in the national colours and to add to the 1916 atmosphere, there will be a "1916 themed " fancy dress with a cash prize for the winner. We are calling on as many people as possible to dress up and get into the spirit of the day! Former town councillor and author of 'A History of Castlebar - Municipal Government 1613 - 2014', Noel Campbell, will give a brief history of the street and then the Proclamation will be read by the founder of Mayo Peace Park, Michael Feeney MBE, at a flag raising ceremony and Castlebar Concert Band will be on hand to play the National Anthem and other tunes for the occasion. There will also be a busking competition during the day with €150 in prizes sponsored by McDermott House Furnishers. All street performers welcome. CRC FM will be there on the day as usual to broadcast the activities live. If anyone has stories or tales from those days gone by, you can tell them to CRC's listenership on air. St/Charles St. area long after the original fairs ended. The Bonamh Market was intermingled with the calf market. Old Moore's Almanac used to refer to the fairs at that time in the town. A baby chick market was held as well as a dillisk stall on the bridge. Large trucks full of clothes used to park and sell the stuff off the back. Bígí linn ag an Margadh Banbh chun an chuid seo de stair Chaisleán an Bharraigh a athbheochan - beidh ceardaíocht, bia, agus spraoi ann!